When I was at the Fancy Food Show in NYC a few weeks ago, I came across a product called GoGo SqueeZ that is made in France by the Materne Company. Essentially, it is "applesauce on the go." 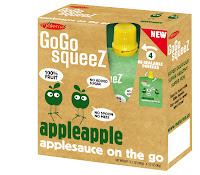 The company describes it perfectly as "the first and only squeezable, re-sealable, no mess, super delicious applesauce to take where you go." The applesauce is made with tasty french apples and is available in boxes of 4-pouches or simply by the pouch. 1 pouch is equivalent to 1 serving of fruit and the applesauce contains no artificial flavors or preservatives and is a healthy, all natural snack that is a good source of Vitamin C.
The applesauce is available in 2 flavors including Apple and Apple Strawberry. You can purchase GoGo SqueeZ on the East Coast at natural health food stores and in select grocery stores in the natural foods section. You may also purchase GoGo SqueeZ applesauce at Ms. Celiac's Market!